The Yangtze (Cháng Jiāng 长江, "long river," in Chinese) is China's greatest river and a historic transport route. This is a huge river; it is over 6,000 km (nearly 4000 miles) long, about the same as the Mississippi. Only the Amazon and Nile are longer. It is the world's sixth largest river by volume of water discharged, at over 30,000 m³ a second, roughly double the Mississippi or Mekong, three times the Saint Lawrence, four times the Danube, and more than ten times little streams like the Rhine or Nile. The Yangtze has been an important transportation route with major cities along its banks for several thousand years. The Chinese Empire first developed along the Yellow River (Huang He) and shortly thereafter spread both to the lower Yangtze basin around Lake Tai (which until then was home to the Liangzhu Culture) and to the rich agricultural lands of Sichuan a thousand km or more up the river. As the main link between those areas, the Yangtze has been important through most of Chinese history. The Western name "Yangtze" comes from the stretch of the river from Yangzhou to Zhenjiang, called the Yangzi (扬子) in Chinese. This was the name first heard by Western missionaries and traders, particularly by the British, and it has stuck. It is named in honor of the former emperor Yang. Most Chinese will not understand what you mean if you don't use the proper Mandarin title of chang jiang (long river) unless they are familiar with English. Zhenjiang, the girlhood home of Pearl Buck, a daughter of an American missionary family who grew up to win a Nobel Prize for novels about China. There are dozens of smaller cities as well. The river extends far beyond Chongqing; its headwaters are deep in the Tibetan mountains. 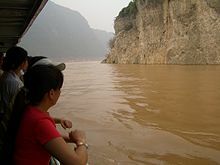 Few tourists doing the Yangtze route follow the river much beyond Chongqing. However, travellers on the Yunnan tourist trail see some of the upper reaches of the river near Lijiang. The Yangtze is also one of the three rivers in Three Parallel Rivers National Park, a UNESCO World Heritage region in Yunnan. Shanghai has a major international airport with connections to almost anywhere. The other major cities on the route (Nanjing, Wuhan, Chongqing) have airports with good connections throughout China, but few direct international flights. However, KLM flies Amsterdam-Chengdu and Amsterdam-Kunming, Air France flies Paris-Wuhan, Lufthansa Frankfurt-Nanjing and Korean Air has flights from Seoul to several of these cities. Finnair offers direct flights to Chongqing. From Southeast Asia, a popular cheap flight into the region is Air Asia Kuala Lumpur to Hangzhou. The most famous part of this route is the sensational cruise ships through the Three Gorges area between Chongqing and Yichang. With the recent enormous Three Gorges Dam project, this route has changed considerably but it is still definitely worth doing. A huge number of people were displaced when the Three Gorges Dam was built; a large area of what used to be fairly densely populated farming country with market towns scattered through it is now underwater. A number of new towns were built in the area and many people were relocated to Chongming District in Shanghai. Be careful of the different types of boats and classes within those boats. Traveling on a Chinese tourist boat in 'first class' may not be your idea of 'first class' (one traveller complained of "rats everywhere"). In addition, the only choice for food may be the boat itself for up to three days. It is advisable to bring supplies, particularly snacks and drinks, for the voyage. The locals often bring ramen noodles or other soups; hot water is readily available. If you want a good experience on the Yangtze, pay the extra for a luxury cruise. Fare on these often includes excursions with English speaking guides and all meals on-board except the dinner on the check-in day. Almost all the tourists travelling on those cruises are very satisfied with the journey. While one reviewer suggested not to take the Chinese Tourist boat (since they stop at destinations at 6AM, expecting all passengers to get out and look at the scenery, then arriving at 4AM at the final destination and throwing everybody off the boat), another reviewer had a positive experience despite not speaking any Chinese. Take photos and video at dusk or dawn when the haze from air pollution is not as pronounced. The lower Yangtze areas; from Wuhan down through Nanjing and Suzhou to Shanghai; travelling by boat is also an option, but here it is not essential. There are good rail and road connections throughout the area. See High-speed rail in China for Nanjng-Wuxi-Suzhou-Shanghai-Hangzhou routes. In Hubei, where the river flows across low-lying fertile plains, it is paralleled on both sides with tree-lined levees, on top of which fairly pleasant roads exist. See Hubei#See on more details on traveling along the levees. Be especially wary of thieves on the cruise boats, using any technique from picking pockets to crawling in portholes to rifle luggage. head South toward Kunming, Yunnan by road or rail. If your ultimate goal is Tibet, Kunming at 2000 m is a good place to acclimatize before heading into higher areas. This itinerary to Along the Yangtze River is a usable article. It explains how to get there and touches on all the major points along the way. An adventurous person could use this article, but please feel free to improve it by editing the page.